For the Spanish athlete, see Alexis Sánchez (athlete). For various people of a similar name, see Alex Sánchez. Alexis Alejandro Sánchez Sánchez (Spanish pronunciation: [aˈleksis ˈsantʃes]; born 19 December 1988), also known simply as Alexis, is a Chilean professional footballer who plays as a forward for English Premier League club Manchester United and the Chile national team. Sánchez began his career as a youth player for Cobreloa at age 17, completing a season at the club before relocating to Italy to play for Udinese in 2006. He won his first trophies in the following seasons, winning consecutive league titles in loans spells to Colo-Colo and River Plate. In 2008, he returned to Udinese, becoming an integral member of the team in his first full season at the club. After three seasons in Italy, Sánchez moved to Barcelona in a transfer worth €30 million (£25 million), becoming the most expensive Chilean player of all time. In his first season at Barcelona, Sánchez starred in an attacking trio alongside Lionel Messi and David Villa, helping the club win the Copa del Rey, Supercopa de España, UEFA Super Cup, and FIFA Club World Cup. The trio scored a total of 82 goals the following season, as the club won the 2012–13 La Liga, as well as retaining the Supercopa de España, before Sánchez enjoyed his highest scoring return at the Blaugrana, ending the season with a total of 21 goals, and 14 assists. Following the high-profile arrival of Neymar in 2013, Sánchez transferred to Premier League side Arsenal in a deal worth £31.7 million (€35.8 million) a year later. At Arsenal, Sánchez quickly established himself as the figurehead of the team, completing every season in England with double figures in both goals and assists. He also won the FA Community Shield, as well as the FA Cup on two occasions, scoring in both finals. In the 2016–17 season, Sánchez scored 30 goals and provided 14 assists, his best return as a professional footballer, while going onto being nominated for the FIFPro World XI. However, after lacking "inspiration" at the direction of the club, he signed for rivals Manchester United in a swap deal in 2018. Popularly dubbed "El Niño Maravilla" (The Wonder Child), Sánchez has been a full international for Chile since 2006, and has earned 124 caps, making him the team's most capped player of all-time. With 41 goals, he is the country's all-time leading goalscorer. He played in an instrumental role in allowing Chile to reach the final of the 2017 FIFA Confederations Cup, while further leading the side to their first international victory at the 2015 Copa América, scoring the winning penalty in the final against Argentina. He later contributed to a repeat of this triumph, aiding in the side's retention of the trophy and winning player of the tournament at the Copa América Centenario. Born in Tocopilla, Sánchez was a product of C.D. Cobreloa's prolific youth ranks where he was teammate of current Chile national team players such as Charles Aránguiz and Eduardo Vargas. In February 2005, Sánchez was promoted to the senior first team by manager Nelson Acosta. Sánchez's made his debut against Deportes Temuco in February and scored his first professional goal in a 2–1 victory over Deportes Concepción on 18 March, allowed him play his first Copa Libertadores game against Once Caldas aged 16, which made him one of the youngest players on debut for the tournament. After an impressive season with Cobreloa, Sánchez caught the attention of Serie A club Udinese, which signed him for a £1.7 million fee, on 21 April 2006. Udinese, however, began a maturation project with Sánchez and immediately loaned him to Chilean giants Colo-Colo in a season-long deal. Sánchez on loan at Colo-Colo against Audax Italiano in the 2006 Torneo Clausura final. Sánchez debuted for Colo-Colo on 23 June 2006 in a 1–1 draw with Antofagasta; he scored his first goal on 29 October during the Chilean football derby against Universidad de Chile in a 4–2 win. His good performances allowed him break into the starting lineup after successfully challenging veteran striker Mario Cáceres, so that began partnering Humberto Suazo in the forward position. On 1 November, he scored a brace in a 4–4 league draw against Deportes La Serena. as well as his first continental goal in a 7–2 thrash over Alajuelense from Costa Rica for the Copa Sudamericana. Nevertheless, Colo-Colo was runner-up of that tournament after losing the final against Pachuca of Mexico. On 23 December 2006, Sánchez won his first professional title after being starter in the Torneo Clausura final against Audax Italiano which his team won 3–2. The next season, on 23 March 2007, he scored his first Copa Libertadores goals against Caracas at Cúcuta where he netted a hat-trick to a 4–0 away win. 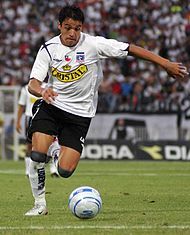 On 12 May, Sánchez scored his first and only one league goal during a 3–1 home win over Santiago Wanderers, key in the race for title with Universidad Católica which Colo-Colo finally reached after beat Palestino 1–0 at Monumental the last matchday. Noteworthy, it meant the club's 26th league title. After Sánchez's impressive FIFA U-20 World Cup (where Chile achieved the third place with José Sulantay as coach), his loan with Colo-Colo expired and on 15 August 2007, he joined Argentina's River Plate on loan from Udinese. After a successful season in Argentina, Sánchez left South America in July 2008 to join Udinese, where he would meet up with Chilean compatriot Mauricio Isla. Sánchez made his non-competitive debut in a 3–0 win over Bassano and was named the man of match. On 14 September, he played his first Serie A match in a 1–0 loss with Juventus and four days later, he made his European debut against Borussia Dortmund. On 19 October 2008, Sánchez scored his first league goal against Lecce. After this first goal, Sánchez got into a minor slump, in which he took much criticism. The criticism ended after scoring the winning goal in the 90th minute against Bologna in a 1–0 win, being named the man of match. Sánchez (right) and fellow Chilean Mauricio Isla in a UEFA Cup match against Spartak Moscow, on 6 November 2008. The next season, Sánchez played an important role for Udinese in the Coppa Italia, being a key player in the team that eliminated Milan, assisting Gökhan Inler for the winning goal. In the semi-final second leg, Sánchez was the man of match after playing a successful game against Roma, including scoring his first Coppa Italia goal in the 81st minute. It was not enough, however, as the aggregate score finished 2–1 in favour of Roma. By the end of this year, Sánchez scored a total of 5 goals (4 at the end of tournament) in 32 appearances. On 27 February 2011, Sánchez scored four of his team's seven goals as Udinese comfortably defeated Palermo 7–0, playing only the first 52 minutes of the game. This event meant he broke the record of goals scored by a Chilean player (in a single match) in Serie A, beating the records set by countrymen Marcelo Salas and Iván Zamorano. During his successful season at Udinese, Sánchez and Italian striker Antonio Di Natale became one of the best scoring duos in Serie A; they tallied 39 goals between them, two goals short of the Alessandro Del Piero–David Trezeguet duo that completed 41 goals in the 2007–08 season. In recognition of his achievements, Sánchez was named the world's most promising youngster of the 2011 season by the users of FIFA.com, where users had to choose between Sánchez, Gareth Bale, Javier Pastore, Ganso and Neymar in a poll. Sánchez ranked 56th in the May 2011 edition of Castrol Performance Index and 24th among the forwards. "I am a great admirer of Ronaldo. I want to wear the same number. He wore number 9 here and was very successful"
On 20 July 2011, Barcelona confirmed they had agreed to a €26 million fee (including €11.5 million in certain bonuses) with Udinese for the transfer of Sánchez, becoming the first Chilean to play for the club. "Sánchez is very young," said then-manager Pep Guardiola; "He can play in all three attacking positions, he shows intense defensive skills, he's direct and from what I've been told, he's a very nice kid." The transfer was finalised five days later when he passed a medical and signed a five-year contract. "I want to learn from players like Lionel Messi and Xavi Hernández—and I want to help the club win more titles," said Sánchez. Sánchez (far left) celebrating with his Barcelona teammates after defeating Santos in the 2011 FIFA Club World Cup Final. Sánchez's debut season for Barcelona was mired with short-term injuries. He made his debut on 14 August 2011 against archrivals Real Madrid in the 2011 Supercopa de España first leg away match, suffering a thigh injury after a challenge by Marcelo. Barcelona won the tie 5–4 on aggregate. He made his return two weeks later as a substitute in the 2011 UEFA Super Cup, won by Barca 2–0. Alexis then started the opening match of La Liga, at home against Villarreal, and scored his first goal in a 5–0 win. A week later, on 10 September, he was stretchered off after 30 minutes following a challenge from Dani Estrada in a domestic league match against Real Sociedad. Sánchez returned on 1 November in an away match against Viktoria Plzeň. On 10 December, he scored Barça's equaliser against Real Madrid in a match they went on to win 1–3 away at the Santiago Bernabéu Stadium. On 14 February 2012, Sánchez scored the first and second UEFA Champions League goals of his career in Barcelona's 3–1 victory against Bayer Leverkusen. In the 2012–13 campaign, on 2 October 2012 Sánchez scored the first goal for Barcelona in a 0–2 away win against Benfica. On 10 February 2013, then scored his first goal of the Liga season in Barça's 6–1 home win against Getafe. From February onwards, Sánchez scored in matches against Deportivo de La Coruña, Mallorca, Athletic Bilbao, Real Betis, Atlético Madrid and Espanyol to end the season with eight league goals. Barcelona won the league title, ending the season with 100 points. On 26 October 2013, Sánchez scored the winning goal as Barça beat Real Madrid 2–1 at Camp Nou in the first Clásico fixture of the 2013–14 La Liga season. On 5 January 2014, Sánchez scored his first hat-trick for Barcelona in a 4–0 win against Elche. He ended the 2013–14 season with a career-high 21 goals in all competitions, including 19 in La Liga. On 10 July 2014, Sánchez signed for Arsenal on a long-term contract for a transfer fee of £31.7 million. Sánchez was given the squad number 17, previously worn by Nacho Monreal, who took the vacant number 18 instead. In a statement released by the club, Sánchez said that he was "so happy to be joining Arsenal, a club which has a great manager, a fantastic squad of players, huge support around the world and a great stadium in London". Manager Arsène Wenger praised Sánchez, saying that the Chilean international "has consistently produced top-quality performances at the highest level for a number of seasons now and we are all excited to see him integrate into the Arsenal squad." Sánchez made his first appearance for Arsenal on 2 August 2014, as a substitute during a 5–1 win against Benfica in the pre-season Emirates Cup tournament. Sánchez's first competitive appearance was against Manchester City in the Community Shield, on 10 August, playing in the first half and helping Arsenal to a 3–0 win. On 16 August, he made his Premier League debut against Crystal Palace, assisting Laurent Koscielny's equaliser in a 2–1 home win. He then scored his first goal for Arsenal on 27 August, slotting the ball past Beşiktaş goalkeeper Tolga Zengin in stoppage time of the first half to secure a 1–0 aggregate victory and a spot in the group stage of the 2014–15 Champions League. Following the game, Wenger was full of praise for Sánchez, with the Arsenal manager saying, "He had a good game, not only on the technical side but on the fighting side. He was mobile, dangerous and has shown as well he has great fighting spirit, qualities that will be very important in the Premier League." His first league goal came four days later, netting the opening goal in a 1–1 draw away to newly promoted Leicester City. He then scored his second league goal in as many games against previous season champions Manchester City, demonstrating perfect technique to sidefoot a volley high past goalkeeper Joe Hart in a 2–2 draw at the Emirates Stadium. Sánchez scored his fourth goal for Arsenal, from a free-kick, as the Gunners fell to 2–1 defeat to Southampton in the League Cup. He scored his first goal in the Champions League proper for the Gunners on 1 October, scoring Arsenal's third goal of their 4–1 home win over Galatasaray and also provided assists for two goals by Danny Welbeck. On 18 October, he scored the opening goal and later assisted a late Welbeck equaliser in a 2–2 draw against Hull City at home. The following league fixture saw him scoring a brace against Sunderland after capitalising on errors made by defender Wes Brown and former Arsenal goalkeeper Vito Mannone. On 1 November, Sánchez again scored a brace, this time against Burnley in a 3–0 victory. With that brace, he scored his ninth and tenth goals of the season across all competitions. He and Yaya Sanogo scored against Borussia Dortmund in 2–0 win as Arsenal qualified for the knockout stages of the Champions League. On 3 December, he scored the winner against Southampton in the 89th minute to give the Gunners a 1–0 win. Sánchez scored the first goal in Arsenal's 2–1 home win over Queens Park Rangers on 26 December and assisted the second goal for Tomáš Rosický; earlier in the same match, Sánchez had a penalty saved by goalkeeper Robert Green after being brought down by Armand Traoré. On 4 January 2015, Sánchez scored and assisted his first ever FA Cup goals as Arsenal knocked out Hull City, the previous season's runners-up in the third round. Sánchez assisted Per Mertesacker and scored in the 82nd minute, being substituted two minutes later by Chuba Akpom. In Arsenal's next Premier League match, against Stoke City, Sánchez was involved in all the three goals as Arsenal beat the Potters 3–0 at the Emirates. He first assisted Laurent Koscielny and then scored two goals of his own. His performance was praised by Thierry Henry, who called him, "Arsenal's best signing of the last six years." On 4 March, Sánchez ended a run of eight games without a goal by scoring Arsenal's second goal as they beat QPR 2–1 at Loftus Road. Sánchez scored Arsenal's third goal on 4 April as they beat Liverpool 4–1 at the Emirates and was chosen as the man of the match. On 18 April, Sánchez scored both of Arsenal's goals in the FA Cup semi-final as Arsenal defeated Reading 2–1 after extra time. Eight days later, he was the only Arsenal player named in the PFA Team of the Year. On 4 May, Sánchez scored another brace, this time against Hull City in a 3–1 away win. On 29 May, he was voted as the 2015 PFA Fans' Player of the Year. Sánchez reached his 25th goal of the season in the 2015 FA Cup Final on 30 May with the second goal in a 4–0 defeat of Aston Villa at Wembley Stadium, a long-range strike. Sánchez, who also headed an assist for Theo Walcott's opening goal, became the first Chilean to score in an FA Cup final since Newcastle United's George Robledo in 1952. He capped off his first season by winning Arsenal's Player of the Year award. Sánchez made his first appearance of the 2015–16 season as a substitute in Arsenal's 2–0 loss to West Ham United on the opening day of the 2015–16 Premier League. The following week, on his first start of the season, Sánchez had a header deflected into the Crystal Palace net by Damien Delaney to give Arsenal a 2–1 win at Selhurst Park. The goal, however, was later credited as an own goal by the Palace defender. On 26 September 2015, Sánchez ended a run of ten Premier League matches without a goal by scoring his first hat-trick for Arsenal in a 5–2 win at Leicester. This made him the first player to score hat-tricks in each of the Premier League, Serie A and La Liga. Sánchez then scored his first Champions League goal of the season a few days later, in a 3–2 loss to Olympiacos, latching onto a Theo Walcott cross to head beyond Olympiacos goalkeeper Roberto. The following league match, the last match before the international break, Sánchez scored for the third match in a row, scoring a brace in the first 20 minutes as Arsenal defeated Manchester United 3–0 at the Emirates Stadium and moved up to second place in the league. After the international break, Sánchez carried on his fine goalscoring form by netting against Watford at Vicarage Road, through a Mesut Özil assist, in a 3–0 Arsenal win, keeping Arsenal in second-place and grabbing his sixth goal in three Premier League matches for the club. Following a brief period on the sidelines due to injury, Sánchez returned to full first-team action on 30 January 2016 in the FA Cup fourth round tie against Burnley, scoring Arsenal's second goal of the game following a low cross from Alex Oxlade-Chamberlain. Sánchez netted his first Premier League goal since October with a goal in the North London derby against rivals Tottenham Hotspur, eqaulising for Arsenal in the 76th minute and keeping the Gunners' title challenge alive. During April 2016, Sánchez scored in four consecutive league matches, with goals against Watford, West Ham, Crystal Palace, and a brace against West Bromwich Albion. When launching their new kit for the 2016–17 season, Arsenal announced that Sánchez will change squad number from 17 to 7, which was vacated by the departing Tomáš Rosický. Sánchez scored his first goal of Arsenal's campaign and grabbed his first assist in Arsenal's 3–1 away win over Watford. Sánchez scored his first Champions League goal of the campaign in a 1–1 draw with Paris Saint-Germain on 13 September 2016, latching onto Alex Iwobi's rebounded shot, to secure Arsenal a point in the French capital. Sánchez kept up his spectacular run of form throughout September by netting against Hull, then scoring assisting in a 3–0 victory over Chelsea. He scored a brace in a 1–4 win at Sunderland's Stadium of Light, bringing his total to 50 goals in 106 appearances across all competitions for Arsenal. He also scored a hatrick and provided an assist in a man of the match display in a 5–1 win at West Ham on 3 December. On 22 January 2017, Sánchez scored his first penalty for the club (having missed his previous two) against Burnley in an eventual 2–1 win, which put Arsenal into second place in the Premier League table. Sánchez scored his first goal in the season's FA Cup, in a 5–0 quarter-final win over Lincoln City, taking his tally to 21 goals for the season in all competitions. Sánchez scored the winning goal in Arsenal's 2–1 win over Manchester City, to send Arsenal through to their third FA Cup final, in four years. On 13 April, Sánchez was included in the six player shortlist for the PFA Player of the Year. He also, in May 2017, won Arsenal's Player of the Season award. Sánchez finished off the season by claiming the man-of-the-match award and scoring Arsenal's opening goal in an eventual 2–1 win over Chelsea in the FA Cup Final, ensuring that Arsenal secured a record 13th FA Cup and that manager Arsène Wenger won a record 7th FA Cup in the process. He finished as the club's top goalscorer with 24 Premier League goals, and 30 goals in all competitions, becoming the first player since Robin van Persie in 2011–12 to score more than 20 goals in the league. Sánchez returned from the 2017 Confederations Cup with an injury, and therefore had to miss the team's victory over Chelsea in the 2017 FA Community Shield and the team's opening 4–3 win over Leicester City. Sánchez' first start of the season came in the 4–0 away defeat to Liverpool. But throughout the transfer window, there was increasing speculation about his future, with a huge amount of reports stating his desire to leave, in order to play in the Champions League. A deadline day move to Manchester City was unsuccessful as Arsenal's deal for Sánchez's replacement Thomas Lemar was rejected. He scored his first goal for the season in Arsenal's 3–1 UEFA Europa League victory over German side Köln, in which he picked the ball up outside the penalty area and curled a shot past goalkeeper Timo Horn, to score Arsenal's second goal of the evening. Sánchez also played in Arsenal's 1–0 win over Doncaster Rovers in the League Cup, in which Sánchez provided his first assist of the season, by delivering a cross-field pass which Theo Walcott subsequently put past Doncaster goalkeeper, Ian Lawlor. Sánchez scored his first Premier League goal of the season in a 5–2 win over Everton and he also provided an assist for Mesut Özil to put Arsenal ahead. Sánchez followed up this by scoring the second in Arsenal's 2–0 win against Tottenham on 18 November, and a week later scoring a decisive and controversial injury-time penalty in a 1–0 win against Burnley. Sánchez continued his fine goalscoring form by scoring Arsenal's third goal in a 5–0 rout of Huddersfield Town, his third goal in consecutive games. He also scored with a diving header against Liverpool on 22 December in a thrilling 3–3 draw. He scored his last two goals for Arsenal in a 3–2 away win against Crystal Palace on 28 December. On 22 January 2018, it was announced that Sánchez had completed a transfer to Manchester United, in a swap deal that saw Henrikh Mkhitaryan move the opposite way. Sánchez was given the number 7 shirt. He made his debut for the club in a 4–0 victory against Yeovil Town in the fourth round of the FA Cup. He became the first Chilean to play a competitive match for United. He scored his first United goal on 3 February 2018 in a 2–0 home win against Huddersfield Town, after netting in the rebound from his penalty that had been saved by Jonas Lössl. He scored his first goal of the 2018–19 season on 6 October, scoring a 90th minute winning goal to complete a 3–2 comeback win over Newcastle United, after the club initially went 0–2 down in the first ten minutes. Sánchez made his international debut for the Chile national team against New Zealand on 27 April 2006. He was called up by the coach José Sulantay to represent the Chilean under-20 team at the 2007 FIFA U-20 World Cup held in Canada, where they finished third. After his participation in the youth championship, Sánchez scored his first senior international goal in a 2–1 loss against Switzerland on 7 September 2007. He scored three times during La Roja's successful 2010 FIFA World Cup qualification campaign and appeared on every match during the tournament finals. He then participated in the 2011 Copa América, scoring once in a 1–1 group stage draw with Uruguay, as Chile reached the quarter-finals. On 15 November 2013, Sánchez scored both goals as Chile beat England 2–0 at Wembley, repeating the achievement of national team legend Marcelo Salas in 1998. Sánchez playing against David Luiz of Brazil at the 2014 FIFA World Cup. Sánchez scored four times in Chile's qualification campaign for the 2014 FIFA World Cup. On 13 June 2014, Sánchez scored Chile's opening goal of the 2014 World Cup, and provided an assist, in a 3–1 defeat of Australia in Cuiabá. During the round of 16, Sánchez scored the equalising goal in a 1–1 draw against the hosts Brazil. However, he was one of three Chileans to fail to convert their kicks in the penalty shootout, having his shot saved by Júlio César as Brazil prevailed 3–2. Sánchez was a member of Chile's squad as they hosted the 2015 Copa América. He assisted Eduardo Vargas in Chile's 2–0 win over Ecuador in the tournament opener, then scored a header in their final group game, a 5–0 win against Bolivia which sent Chile through as group winners – he and Arturo Vidal were rested by being substituted at half time. 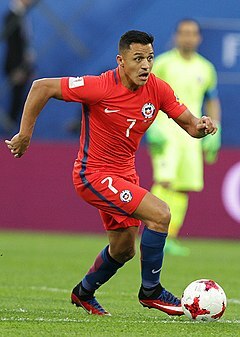 Sánchez was named man of the match in Chile's ill-tempered and highly controversial quarter-final win over defending champions Uruguay. In the semi-final against Peru, he created the opening goal for Eduardo Vargas as Chile progressed to the final with a 2–1 victory. On 4 July, Sánchez converted the winning kick in the final as Chile defeated Argentina in a penalty shootout to win their first major title, executing it in the Panenka style. In Chile's first match of 2018 World Cup qualification on 9 October 2015, Sánchez scored in a 2–0 win over Brazil, Chile's first victory against the opponents since 2000. Four days later, he scored twice in a 4–3 win at rivals Peru. In June 2016, Sánchez was part of the Chile squad that defended their Copa América title at the Copa América Centenario in the United States. On 14 June, needing a draw to progress to the knockout rounds, Chile fell 1–0 behind to Panama before both Sánchez and Eduardo Vargas scored twice in a 4–2 win in Philadelphia to qualify for the tournament quarter-finals. Four days later, he scored one goal and registered two assists at Levi's Stadium in a 7–0 rout of Mexico, who were previously on a 22-game unbeaten streak. In Chile's 2–0 semi-final victory over Colombia, he became only the second Chilean – after Claudio Bravo – to reach 100 caps. Sánchez was involved in Chile's second goal when his shot rebounded off the inside of the post and across the goal, presenting a tap-in for José Pedro Fuenzalida. In a repeat of the previous Copa América final, Chile faced Argentina. Both teams had a player sent-off before half-time, and after a 0–0 draw, Chile were victorious via penalty kicks (4–2) to retain their title. Sánchez was awarded the Golden Ball as the tournament's best player. In Chile's opening match of the 2017 FIFA Confederations Cup on 18 June, Sánchez, who had been recovering from an ankle injury, came off the bench to set up Arturo Vidal's opening goal in an eventual 2–0 win over Cameroon. On 22 June 2017, Sánchez became Chile's out-right all-time goalscorer when he scored the opening goal in an eventual 1–1 draw against reigning World Cup champions Germany in his team's second group match of the tournament, overtaking Marcelo Salas with his 38th international goal in 112 appearances, and also equalling Claudio Bravo as his nation's joint top appearance holder in the process. Chile defeated Portugal on penalties in the semi-final, before losing 0–1 in the final against Germany, with Sánchez coming close to an equaliser with his injury time free kick saved by German goalkeeper Marc-André ter Stegen. Sánchez is a quick, creative and hard-working player with an eye for goal, who is known in particular for his energy, skill and work-rate on the pitch. Although naturally right-footed, due to his ability with either foot, he is capable of playing anywhere along the front line, on either flank, or through the centre of the pitch: throughout his career, he has been deployed as a supporting striker, as a winger, as a false-9, and even as an attacking midfielder; he has recently also been used in a more advanced, central role, as a main striker. A talented forward, Sánchez is gifted with excellent technical ability, agility, flair and acceleration, which enables him to dribble past opponents with feints in one on one situations, create space, and either score goals himself or set-up his teammates. Being an accurate striker of the ball, he is also effective from set-pieces. Sánchez had a statue erected in his honour within his native town of Tocopilla in March 2017. In October 2015, Sánchez was named as a brand ambassador for Huawei. He appeared in an advert to the tune of Blondie's "One Way or Another" for Huawei which made its debut in November 2016. In February 2017, Sánchez signed a sponsorship deal with Pepsi. ^ a b c "Alexis Alejandro Sánchez Sánchez". Soccerway. Perform Group. Retrieved 16 April 2019. ^ a b c d "Alexis Sanchez Profile". Arsenal FC. Retrieved 17 July 2014. ^ "Alexis Sánchez Profile". UEFA. Retrieved 7 February 2015. ^ "Alexis Sánchez Profile". ESPN FC. Retrieved 7 February 2015. ^ "2014 FIFA World Cup squadlists" (PDF). FIFA. Retrieved 7 February 2015. ^ "Los traspasos más caros de Chilenos" (in Spanish). Retrieved 21 July 2014. ^ "Sanchez takes parting shot at Arsenal critics before completing move". 22 January 2018. ^ Rory Smith (18 June 2011). "Udinese forward Alexis Sanchez on the road to greatness". The Telegraph. Retrieved 3 January 2018. ^ "Alexis Sanchez reaches 100 caps for Chile". Goal.com. ^ "Alexis Sanchez's Career Achievements". Genius.com. ^ "Arsenal's Alexis Sanchez: The squirrel who scurried his way to the top". The Guardian. ^ "Calama: El recuerdo de 6 seleccionados que jugaron en Cobreloa". Emol (in Spanish). 31 May 2012. Retrieved 25 October 2014. ^ "Nelson Acosta alaba el nivel de Alexis Sánchez" (in Spanish). La Tercera. 13 August 2009. Archived from the original on 25 October 2014. Retrieved 25 October 2014. ^ "Ex técnicos de Alexis aconsejan al tocopillano: "Que se vaya de Barcelona"" (in Spanish). La Tercera. 8 July 2014. Retrieved 25 October 2014. ^ "Medio catalán homenajeó a Alexis Sánchez a nueve años de su debut". Redgol.cl (in Spanish). 12 February 2014. Retrieved 25 October 2014. ^ "¡Feliz cumpleaños Alexis Sánchez! Recuerda su primer gol como profesional". CDF.cl (in Spanish). 19 December 2012. Retrieved 25 October 2014. ^ "Ganó el que quiso, perdió el que se replegó" (in Spanish). ESPN Deportes.com. 22 March 2005. Retrieved 25 October 2014. ^ "Udinese sería el nuevo equipo de Alexis Sánchez" (in Spanish). Retrieved 21 July 2014. ^ "Borghi renovó contrato con Colo-Colo" (in Spanish). Retrieved 21 July 2014. ^ "Colo Colo se dio un festín y se quedó con el Superclásico en el Monumental". Emol (in Spanish). 13 October 2006. Retrieved 21 July 2014. ^ "La Serena tuvo una reacción increíble para frenar la racha de Colo Colo" (in Spanish). Radio Cooperativa. 1 November 2006. Retrieved 21 July 2014. ^ "Prensa costarricense destroza a Alajuelense tras derrota con Colo Colo" (in Spanish). Retrieved 21 July 2014. ^ "Pachuca se queda con la corona y Colo Colo con las lágrimas". Emol (in Spanish). 13 December 2006. Retrieved 21 July 2014. ^ "Prensa venezolana dice que Caracas fue 'un desastre' ante Colo Colo". Emol (in Spanish). 21 March 2007. Retrieved 25 October 2014. ^ "Colo Colo golea 4–0 a Caracas FC y sigue vivo en la Copa Libertadores". Emol (in Spanish). 20 March 2007. Retrieved 25 October 2014. ^ "Colo Colo olvidó la Libertadores ganando a Wanderers". Emol (in Spanish). 12 May 2007. Retrieved 25 October 2014. ^ "Colo Colo sufrió para derrotar a Palestino y consiguió estrella 26". Emol (in Spanish). 16 June 2007. Retrieved 25 October 2014. ^ "Alexis Sánchez a River" (in Spanish). diario26.com. 15 August 2007. Retrieved 25 October 2014. ^ "Gran debut de Alexis Sánchez en Udinese". adn mundo.cl (in Spanish). Archived from the original on 29 July 2008. Retrieved 27 July 2008. ^ "Gokhan Inler Sends The Rossoneri Packing From Coppa Italia". goal.com. Retrieved 27 February 2010. ^ "Alexis Sánchez anotó en eliminación de Udinese ante la Roma" (in Italian). triunfo.cl. Archived from the original on 24 April 2010. Retrieved 22 April 2009. ^ "Alexis Sanchez's Quart-Trick Demolished Palermo". serieaticketsonline.com. Archived from the original on 26 March 2012. Retrieved 27 February 2011. ^ "Udinese's Alexis Sanchez voted the world's most promising youngster in Fifa poll". Goal.com. Retrieved 17 June 2011. ^ "Alexis Sanchez picks his Ultimate XI – and no Arsenal players feature!". Sky Sports. Retrieved 7 September 2018. ^ "Alexis Sanchez: I want to emulate Ronaldo". Goal. Retrieved 7 September 2018. ^ "Barça sign Alexis Sánchez". FC Barcelona. 20 July 2011. Archived from the original on 29 July 2012. Retrieved 25 July 2011. ^ a b "Alexis Sanchez joins Barcelona from Udinese for £23m". BBC Sport. 21 July 2011. Archived from the original on 21 July 2011. Retrieved 26 July 2011. ^ "Barcelona confirm £23.75m deal to buy Alexis Sánchez from Udinese". The Guardian. 21 July 2011. Archived from the original on 22 July 2011. Retrieved 26 July 2011. ^ "Bingo Rooms & Promotions". Barcaloco.com. 9 March 2017. Retrieved 11 October 2017. ^ "Viktoria Plzen vs. Barcelona – Football Match Report – November 1, 2011 – ESPN". ESPNFC.com. Retrieved 11 October 2017. ^ Brassell, Andy (2 October 2012). "Clinical Barcelona show mettle at Benfica". UEFA. Retrieved 17 July 2014. ^ "Sanchez relieved to break goal drought". 10 February 2013. ^ "FC Barcelona 2012/13 Season in Review: Alexis Sanchez". Barcablaugranes.com. ^ "Barcelona 2–1 Real Madrid". BBC Sport. 26 October 2013. ^ "First hat trick for Alexis Sánchez". FC Barcelona. 5 January 2014. ^ "Liverpool target Wilfried Bony and Alexis Sanchez to add more goals to their already fearsome attack". Metro. 18 May 2014. Retrieved 18 May 2014. ^ "Spanish La Liga Stats: Top Goal Scorers – 2013–14". ESPN FC. Retrieved 18 May 2014. ^ a b c "Alexis Sanchez agrees to join Arsenal". Arsenal F.C. 10 July 2014. Retrieved 10 July 2014. ^ "Arsenal confirm the signing of Alexis Sánchez from Barcelona". The Guardian. 10 July 2014. Retrieved 11 July 2014. ^ "Alexis Sanchez: Barcelona forward signs for Arsenal". BBC Sport. 10 July 2014. Retrieved 10 July 2014. ^ Doyle, Paul (2 August 2014). "Arsenal's Yaya Sanogo hits four in friendly rout of Benfica". The Guardian. Retrieved 3 August 2014. ^ Harris, Chris (10 August 2014). "Man City 0–3 Arsenal – Match report". Arsenal F.C. Retrieved 13 August 2014. ^ Chowdhury, Saj (16 August 2014). "Arsenal 2–1 Crystal Palace". BBC Sport. Retrieved 16 August 2014. ^ McNulty, Phil (27 August 2014). "Arsenal 1–0 Besiktas". BBC Sport. ^ Whalley, Mike (31 August 2014). "Leicester 1–1 Arsenal". BBC Sport. Retrieved 31 August 2014. ^ McNulty, Phil (13 September 2014). "Arsenal 2–2 Manchester City". BBC Sport. Retrieved 13 September 2014. ^ Kelly, Rob (23 September 2014). "Arsenal 1–2 Southampton – Match Report". Arsenal F.C. Retrieved 1 October 2014. ^ "Champions League: Danny Welbeck nets hat-trick as Arsenal ease past Galatasaray". Sky Sports. 1 October 2014. Retrieved 1 October 2014. ^ Winton, Richard (25 October 2014). "Sunderland 0–2 Arsenal". BBC Sport. Retrieved 4 April 2015. ^ a b Gheerbrant, James (1 November 2014). "Arsenal 3–0 Burnley". BBC Sport. Retrieved 4 April 2015. ^ Chowdhury, Saj. "Arsenal 2–0 Borussia Dortmund". BBC Sport. Retrieved 4 April 2015. ^ McNulty, Phil. "Arsenal 1–0 Southampton". BBC Sport. Retrieved 4 April 2015. ^ Lewis, Aimee (26 December 2014). "Arsenal 2–1 QPR". BBC Sport. Retrieved 26 December 2014. ^ Jurejko, Jonathan. "Arsenal 2–0 Hull City". BBC Sport. Retrieved 4 April 2015. ^ Whaling, James (14 January 2015). "Alexis Sanchez is Arsenal's best signing in the last six years, says Gunners legend Thierry Henry". Daily Mirror. Retrieved 4 April 2015. ^ Farmery, Tom (5 March 2015). "'He never gives up' – Arsenal manager Arsene Wenger praises Alexis Sanchez after ending barren spell". London Evening Standard. Retrieved 4 April 2015. ^ McNulty, Phil. "Arsenal 4–1 Liverpool". BBC Sport. Retrieved 4 April 2015. ^ "Holders Arsenal reached a record 19th FA Cup final after two goals from Alexis Sanchez sealed victory over Reading in extra-time". 18 April 2015. Retrieved 18 April 2015. ^ a b "Chelsea's Eden Hazard named PFA Player of the Year". BBC Sport. 26 April 2015. Retrieved 7 May 2018. ^ "Hull City 1 – Arsenal 3". BBC Sport. ^ "Alexis Sanchez Crowned PFA Fans' Player of the Year". Retrieved 18 July 2015. ^ "FA Cup final – FT: Arsenal 4–0 Villa". BBC Sport. 30 May 2015. ^ a b "Player of the season and the winner is." Arsenal F.C. ^ "Crystal Palace 1–2 Arsenal". BBC Sport. 16 August 2015. ^ "Leicester 2–5 Arsenal". BBC Sport. 26 September 2015. ^ "Arsenal vs Olympiacos Champions League". The Daily Telegraph. ^ "Arsenal 3–0 Man Utd". BBC. Retrieved 5 October 2015. ^ "Watford 0–3 Arsenal". BBC Sport. ^ "Arsenal 2–1 Burnley". BBC Sport. ^ "Tottenham Hotspur 2 – 2 Arsenal". BBC Sport. ^ "English Premier League: Alexis Sanchez double lifts Arsenal into third place". The Sydney Morning Herald. 22 April 2016. ^ "Arsenal and PUMA launch new home kit". Arsenal F.C. 25 May 2016. Retrieved 25 May 2016. ^ "Arsenal 3–1 Watford". BBC Sport. ^ "PSG 1–1 Arsenal". BBC Sport. ^ "Hull City 1 – 4 Arsenal". BBC Sport. ^ "Arsenal 3–0 Chelsea". BBC Sport. ^ "Sunderland 1–4 Arsenal: Alexis Sanchez stars". Daily Mirror. ^ "Alexis Sanchez reaches 50 goals in all competitions for the Gunners". Metro. London. ^ Jennings, Patrick (3 December 2016). "West Ham United 1–5 Arsenal". BBC Sport. Retrieved 24 September 2018. ^ "Arsenal 2–1 Burnley". Bbc.co.uk. 11 October 2017. Retrieved 11 October 2017. ^ "As it happened: Arsenal vs Burnley". Independent.co.uk. 22 January 2017. Retrieved 11 October 2017. ^ "Arsenal 5–0 Lincoln City". BBC Sport. ^ "Arsenal 2–1 Manchester City". BBC Sport. ^ "FA Cup: AET: Arsenal 2–1 Man City-Sanchez hits winner". BBC Sport. ^ "Chelsea 4–2 Tottenham". BBC Sport. 22 April 2017. ^ a b "Vitality Player of Season-the winner." Arsenal F.C. ^ "Arsenal 2–1 Chelsea". BBC Sport. ^ "Arsenal 2–1 Chelsea: 2017 FA Cup Final as it happened". The Guardian. ^ "Liverpool 4–0 Arsenal". Bbc.co.uk. 27 August 2017. Retrieved 11 October 2017. ^ "Alexis Sanchez admits he wants to leave Arsenal and play in the Champions League next season". The Independent. 15 July 2017. Retrieved 24 September 2018. ^ Ornstein, David (1 September 2017). "Alexis Sanchez: Manchester City accept defeat in Arsenal striker pursuit". BBC Sport. Retrieved 24 September 2018. ^ "Arsenal 3–1 FC Cologne". Bbc.co.uk. 14 September 2017. Retrieved 11 October 2017. ^ "Arsenal 1–0 Doncaster Rovers". Bbc.co.uk. 20 September 2017. Retrieved 11 October 2017. ^ McNulty, Phil (22 October 2017). "Everton 2–5 Arsenal". BBC Sport. Retrieved 24 September 2018. ^ McNulty, Phil (18 November 2017). "Arsenal 2–0 Tottenham Hotspur". BBC Sport. Retrieved 24 September 2018. ^ "Burnley 0–1 Arsenal". BBC Sport. 26 November 2017. ^ "Arsenal 5–0 Huddersfield Town". BBC Sport. 29 November 2017. ^ Rose, Gary (22 December 2017). "Arsenal 3–3 Liverpool". BBC Sport. Retrieved 24 September 2018. ^ Rose, Gary. "Crystal Palace 2–3 Arsenal". BBC Sport. Retrieved 24 September 2018. ^ "Alexis signs for Manchester United". Manchester United. 22 January 2018. Retrieved 22 January 2018. ^ "Yeovil Town 0–4 Manchester United". BBC. 26 January 2018. Retrieved 27 January 2018. ^ Marshall, Adam (24 January 2018). "Why United Have Had to Wait for a Chilean". Manchester United. Retrieved 27 January 2018. ^ Smyth, Rob (3 February 2018). "Manchester United v Huddersfield, Leicester v Swansea and more – live!". The Guardian. Retrieved 3 February 2018. ^ "Manchester United 3–2 Newcastle United: Fightback relieves pressure on Mourinho". BBC Sport. 6 October 2018. Retrieved 8 October 2018. ^ a b c "Alexis Sanchez". Eurosport. ^ a b "Alexis Sanchez: 10 Things". Daily Mirror. ^ Gonzalez, Roger (9 July 2011). "Uruguay 1–1 Chile: Alexis Sanchez denies La Celeste first victory in the 2011 Copa America". Goal.com. Retrieved 19 April 2015. ^ "Alexis Sánchez Repeats History at Wembley". I Love Chile. 16 November 2013. Archived from the original on 28 November 2013. ^ "Statistics – America". FIFA. Retrieved 23 November 2013. ^ "Chile 3–1 Australia". BBC Sport. Retrieved 14 June 2014. ^ Ornstein, David (28 June 2014). "Chile 1–1 Brazil". BBC Sport. Retrieved 28 June 2014. ^ "Chile 2–0 Ecuador". BBC Sport. 14 August 2015. Retrieved 12 June 2015. ^ "Chile 5–0 Bolivia". BBC Sport. 20 June 2015. Retrieved 20 June 2015. ^ "Copa America MasterCard Man of the Match winners". CA2015. 14 August 2015. Retrieved 4 July 2015. ^ "Chile 2–1 Peru". BBC Sport. 14 August 2015. Retrieved 7 July 2015. ^ "Chile 0–0 Argentina". BBC Sport. 5 July 2015. ^ "Chile 2–0 Brazil: Vargas & Alexis consign Selecao to defeat". Goal.com. 9 October 2015. Retrieved 14 October 2015. ^ Kalinic, Dejan (14 October 2015). "Peru 3–4 Chile: Sanchez stars in solid win". Retrieved 14 October 2015. ^ Tucker, Duncan (18 June 2016). "Chile humiliate Mexico in 7–0 thrashing to advance to Copa América semi-final". The Guardian. Retrieved 28 June 2016. ^ Edwards, Daniel (23 June 2016). "Alexis Sanchez reaches 100 caps for Chile". Goal.com. Retrieved 28 June 2016. ^ Dutton, Tom (26 June 2016). "Arsenal's Alexis Sanchez named Copa America player of the tournament as Chile defend title". London Evening Standard. Retrieved 28 June 2016. ^ Badshah, Nadeem (18 June 2017). "Arturo Vidal and Eduardo Vargas score as Chile overcome Cameroon despite video referee mayhem". Eurosport. Retrieved 3 August 2017. ^ "Alexis Sanchez becomes Chile's all-time top scorer with 38th goal". ESPN FC. 22 June 2017. Retrieved 24 June 2017. ^ Ogden, Mark (22 June 2017). "Germany's second string earn draw vs. Chile that bodes well for World Cup". ESPN FC. Retrieved 24 June 2017. ^ Harris, Daniel (2 July 2017). "Chile 0–1 Germany: Confederations Cup final – as it happened". The Guardian. ISSN 0261-3077. Retrieved 29 September 2018. ^ a b Carli, Valerio (21 March 2007). "Le nuove stelle arrivano dal Cile" (in Italian). La Gazzetta dello Sport. Retrieved 11 February 2015. ^ a b Corda, Giulia (6 November 2008). "Le meraviglie di Sánchez per l'Udinese" (in Italian). UEFA. Retrieved 18 April 2016. ^ Bate, Adam (12 January 2015). "Premier League: The statistics that show why Arsenal forward Alexis Sanchez is the great all-rounder". Sky Sport. Retrieved 18 April 2016. ^ Tweedale, Alistair (24 September 2015). "Alexis Sanchez has slumped for Arsenal – but why?". The Daily Telegraph. Retrieved 18 April 2016. ^ Fernandez-Abascal, Eduardo (13 November 2014). "Arsenal Star Alexis Sanchez: My Favourite Position Is Out On The Left". International Business Times. Retrieved 18 April 2016. ^ "Sanchez: Premier tougher than La Liga". Football España. 9 October 2014. Retrieved 18 April 2016. ^ Stanger, Matthew (23 August 2014). "Premier League: Arsenal's 'false nine' formation fails to ignite before Olivier Giroud's intervention at Everton". Sky Sports. Retrieved 18 April 2016. ^ MacInnes, Paul (9 December 2016). "Arsène Wenger ends long wait to make Alexis Sánchez a striker at Arsenal". The Guardian. Retrieved 3 January 2017. ^ "ESPN FC Player Profile: Alexis Sánchez". Espnfc.us. Retrieved 11 February 2015. ^ "'Bubbly' Alexis Sanchez loved by everyone, says Arsene Wenger". espnfc.com. Retrieved 11 February 2015. ^ Cross, John. "Alexis Sanchez return a big boost as Arsenal seek win vs. Leicester". Espnfc.com. Retrieved 11 February 2015. ^ "Alexis Sanchez key to Arsenal's Premier League title hopes". Sky Sports. 10 February 2016. Retrieved 18 April 2016. ^ "Pjanic, punizioni meglio di Pirlo, Messi, Ronaldo" (in Italian). Il Corriere dello Sport. 15 April 2015. Retrieved 18 April 2016. ^ "Picture: See the remarkable Alexis Sanchez statue". Football.London. ^ "Alexis follows James steps in South America". Prime Time Sport. ^ "Arsenal ace Alexis Sanchez signs lucrative deal". Daily Express. ^ "Alexis Sánchez stats". La Gazzetta dello Sport (in Italian). Retrieved 13 July 2011. ^ "Goal against Rayo Vallecano was officially given to Sánchez by referee". Real Federación Española de Fútbol (in Spanish). Retrieved 29 April 2012. ^ "Alexis Sánchez". Goal.com. Retrieved 4 April 2015. ^ "Alexis | Teams". Arsenal F.C. 19 December 1988. Retrieved 4 April 2015. ^ a b c d "Arsenal.com: Alexis Sanchez Player Profile". Retrieved 11 February 2015. ^ "Chile: Alexis Sanchez". FIFA. Retrieved 11 February 2015. ^ "Alexis Sanchez: Statistics and Facts". Retrieved 11 February 2015. ^ Prenderville, Liam. "Arsenal star Alexis Sanchez crowned PFA Fan Player of the Month for October". The Mirror. Retrieved 11 February 2015. ^ "Twitter:PFA Player of the Month". Twitter. ^ "Sanchez leads PFA Fans' awards". Sky Sports.com. ^ "BBC Match of the Day: Goal of the Month – October 2015". BBC Sport. ^ "Match of the Day 2: Nov 8, 2015". BBC. ^ "Alexis Sanchez Crowned PFA Fans' Player of the Year". Retrieved 26 May 2015. ^ "Arsenal's Alexis Sanchez named as FSF's Player of the Year". The Guardian. 7 December 2015. Retrieved 14 December 2015. ^ "Arsenal's Alexis Sanchez wins Player of the Year at inaugural Facebook Football Awards". Premier League. 26 May 2015. Retrieved 14 August 2015. ^ "Alexis Sanchez: KCA Favourite Footballer". Kca.nick.co.uk. Retrieved 4 April 2015. ^ a b Gholam, Simeon (28 June 2016). "Copa America Best XI: Alexis Sanchez and Lionel Messi make the grade". Sky Sport. Retrieved 15 January 2018. ^ "FIFA Confederations Cup Russia 2017 – Awards". FIFA. 2 July 2017. Retrieved 2 July 2017. 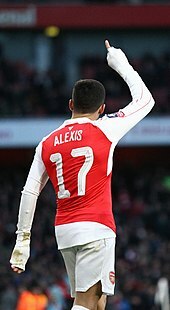 Wikimedia Commons has media related to Alexis Sánchez.